Footwear is a topic that is full of conjecture as well as personal proofs. Out on the trails, people will talk a bit about tents, sleeping bags, packs, stoves etc…. especially at the beginning of a thru-hike. Shoes, on the other hand, seem to be a topic that doesn’t really go away. This is partly because it is a piece of gear that is replaced several times when on one of the longer long distance trails such as the AT, PCT, or CDT, etc… In addition, and maybe more importantly, it is an issue of comfort that is (or isn’t) experienced every moment that you are walking. With today’s lighter loads (even if you don’t consider yourself and ultralight backpacker), the higher boot with protection for the ankle isn’t as necessary. Durability comes at the cost of ‘breaking in’ the footwear – something that isn’t easy to do if you are swapping out shoes mid hike or not able to get sufficient break in time. The materials that are used to make a boot waterproof do not breath sufficiently (despite advertising claims). Out in the woods, it is easy for water to splash up into your footwear even if they are waterproof. If rain/snow doesn’t make your feet wet, your own sweat will. Feet sweat very easily, and it is necessary to let them breath. There are definitely some experienced hikers that I respect who still like their boots, but on the whole, you will find most folks who have done a good bit of miles in trail runners that are breathable (without Gortex or other waterproofing). It is one thing to do day hikes in a pair of shoes that works reasonably well for you, but quite another to find a shoe that feels comfortable day after day when you are hiking many miles each day. On my Appalachian Trail thru-hike, I wore 6 pairs of shoes. New Balance trail runners (2 pairs) – I had purchased two pairs of these before the hike started. They were alright, but really couldn’t take the abuse of banging in to rocks in Maine. While I found these shoes quite comfy, the sole is quite thin, and my feet suffered a bit because of it. Patagonia hiking shoes – these lasted about 100 miles before I sent them back home for refund. The lugs on the sole were popping off on the second day. Scott Trail Runners – Very comfy, and generally a well constructed shoe. This was the first year for this shoe. My wife and I both wore these for several hundred miles on the AT. Decent shoe, we’d both buy these again. Montrail trail runners (2 pairs) – Reasonably constructed and durable. They had a construction flaw with a seem right at the pivot point (where two different densities of sole material meet) on the front of the show which would cause a tear in the material…I had it happen on both pairs, and saw the same with these same shoes worn by others. These shoes are no longer in production. Why so many pairs of shoes? I wasn’t happy with what I could get, plain and simple. I really had hoped that by the end of the trail, I would know the shoe that would work for me day after day on a long distance trail…unfortunately, I didn’t. On the Pacific Crest Trail, I wore four pairs of the same shoes. A good friend highly recommend Brooks Cascadia trail runners. I started the trail with the Cascadias, and finished with them. In fact, it is pretty much the only pair of shoes that I wear off-trail now, whether for work (I am a self employed wood worker), hiking, travelling. I have hike the Long Trail in these as well as the Wonderland Trail and lots of hiking in New Hampshire’s White Mountains. One thing that is quite interesting about the Cascadias is that they seem to work with a variety of foot types. On the PCT, you will see a lot of these. At this point, these are my highest recommended shoe for hiking, be it day hiking or long distance. Brooks introduces a new version of the Cascadias each year, with a slight modification. Occasionally, previous years versions are available at a discount. 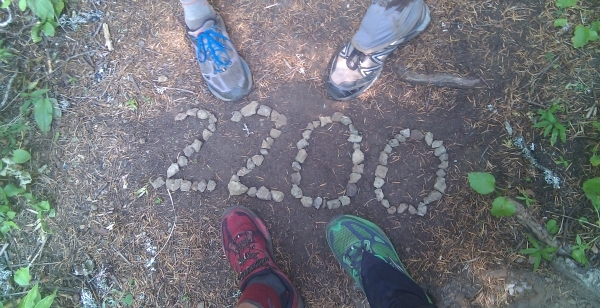 At mile 2200 on the PCT. 3 pairs of Brooks Cascadias and a pair of Salomons. “Like many novice long-distance hikers, I began my first thru-hike on the Appalachian Trail in 2009 with a pair of heavy hiking boots. Over the first 700 miles I noticed how many other thru-hikers were wearing low-cut trail running shoes, so I decided to give them a try for myself, as my boots began to wear out, and I’ve never gone back for spring-through-fall hiking. The Salomon Men’s XA Pro 3D Ultra 2 GTX Trail Running Shoes have been my go-to model for long-distance backpacking. I wore the XA Pros for the final 2/3 of the AT, as well as 2/3 of my PCT thru-hike in 2012 (I finished the PCT in Salomon XT Wings). Before I became a long-distance hiker I wore a size 12 shoe, but I moved up to a size 13 for more wiggle room as my feet expand while hiking 20+ miles per day. In addition to their durability, I like how wide the Salomon shoes are at the toe end. In my old boots my pinky toes would roll under the toes next to them, rub togeter, create blisters and the toenails would slice open the skin on the neighboring toes. Going up a size also helped. It does not take very long to break in these shoes. I have been able to take a pair of Salomons directly off the shelf and begin hiking without much discomfort. Although they are durable, they are also extremely flexible and quickly form to the shape of your foot, thanks to Salomon’s proprietary quick-lace system. The quick-lace system is nice because it is faster than tying a knot, and it comes undone less often than regular shoe laces. The quick-lace system, while easy to use, could be tricky if it fails. The laces are thin, and if you use gaiters that hook onto your shoe laces, they will eventually wear through. I’ve had to tie off the laces that have broken on multiple pairs. The lock on the quick lace system hasn’t failed me while on trail, but the lock on a pair of Salomons sitting in my closet for several months cracked open when I was trying them on again for a day hike.